This fine antique sterling silver christening mug has a cylindrical tapering form onto a plain spreading collet style foot. 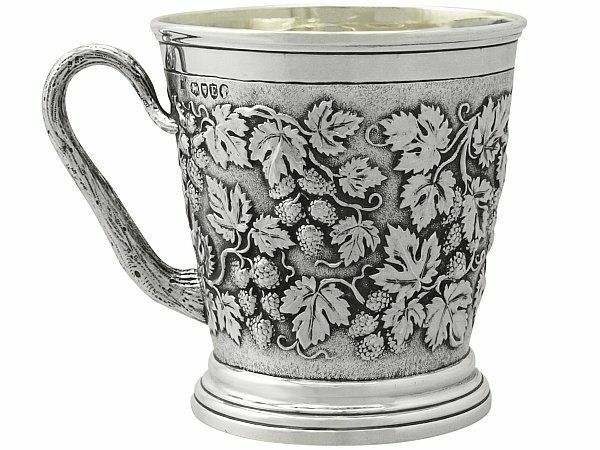 The body of this silver mug is ornamented with a fine and impressive chased decorated grape and vine decoration on a matt background. The decoration to the body incorporates a vacant shield shaped cartouche. The upper rim and foot of the mug are encircled with bands of tooled decoration. The silver mug is fitted with an impressive C shaped handle realistically modelled in the form of a vine. This fine example of antique silverware retains the original gilt interior. 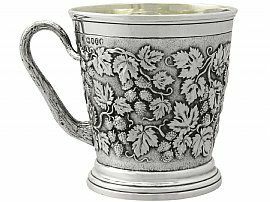 This impressive Victorian mug, crafted by the renowned London silversmiths John Hunt & Robert Roskell, bears the retailers mark 'Hunt & Roskell, Late Storr & Mortimer' to the underside. This antique mug is an exceptional gauge of silver, exceptional quality and in exceptional presentation condition. Full hallmarks struck to the surface of the rim are all very clear. Length from back of handle to rim 11cm/4.3"